There's no doubt at all that Montana has some of the finest mountain ranges anywhere. The mountains up in Glacier are of course my favorites, but honorable mentions go to the ranges that surround Bozeman: the Hyalites, the Spanish Peaks, and especially the Bridgers. The Bridger range defines the eastern edge of the Gallatin Valley for a good two dozen miles, remarkably straight and tall. The views from the ridgeline are uniformly amazing, especially looking down into the Gallatin Valley, some 4,000 feet below. 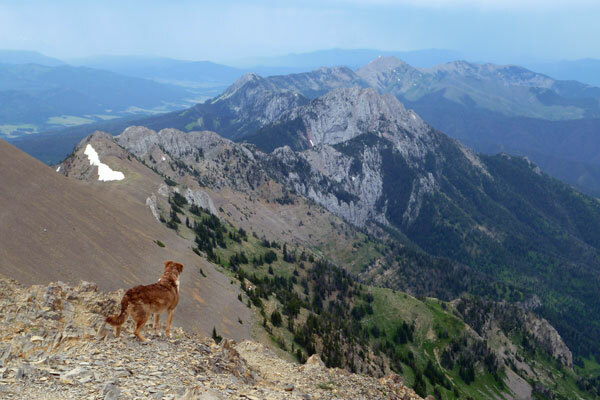 Sacajawea Peak is near the center of the Bridger range, and at 9,665 feet is its highest point. The trail from Fairy Lake up to the summit is a classic, and the view from the top is stellar. Today's photo is from the summit of Sacajawea, looking south along the range. The handsome dog admiring the view is Charlie, my Australian Shepherd; a couple minutes earlier, he'd just been introduced to his first mountain goat.